A perfect Advent celebration guide for families! Celebrating the season of Advent keeps us focused on the most important reasons we celebrate Christmas. A Family Advent presents guided heartfelt and thought-provoking devotionals with fun facts, journeys back in time, activities, and much more. This book is a perfect way to get the whole family together for a few minutes every day to discover fun yet meaningful ways for keeping Jesus the center of the season. Do you know what each verse of The Twelve Days of Christmas really means? Do you know how many different kinds of angels there are or which nativity character is most like you? Do you know how wonderful God’s gifts of Hope, Peace, Love, and Joy are? It’s time to find out. Begin your journey by lighting the first candle! We’ve been doing our annual Advent reading, with the traditional candles, wreath and certain activities (I have yet to acquire a calender system I like). Its been wonderful for our family focusing CHRIST in CHRISTmas. It is so easy to forget why we celebrate this time of year and the Advent tells us why we celebrate this time by breaking it up into weekly events. More on the history of the Advent can be found here. Actually, the book that I would like to recommend to you goes into a bit of detail on how the Advent calender got started. What I really like about A Family Advent; Keeping the Savior in the Season is that it is not dumb down for children but its not so intellectual that they cant comprehend it. They do a bit of what they call “Time Travel” where they “travel” back to a certain time to bring out the event that will take place. That is pretty much the only “fantasy” that happens. It is a very simple book and doesnt need a half hour to go through. Activity plans are included if you so choose. 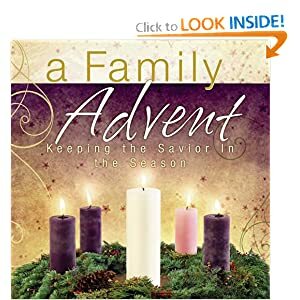 So if you are looking for a good read this advent season, might I suggest looking into, A Family Advent; keeping the Savior in the Season.